Hyperloop Transportation Technologies, (HyperloopTT), a leader in provision of innovative solutions to the transportation industry, today (October 3) offered a first look into its full-scale passenger Hyperloop capsule at an unveiling ceremony in Puerto de Santa Maria, Spain. Speaking at the unveiling cermony, HyperloopTT co-founder and chairman Bibop Gresta said: "We have taken major steps in solving government regulations with our safety certification guidelines and insurance frameworks and are now closer than ever to bringing Hyperloop to the world." "In 2019, this capsule will be fully optimised and ready for passengers," he added. The capsule, “Quintero One”, is constructed almost completely out of HyperloopTT’s Vibranium, a specially-made dual-layer smart composite material. It was built at the Southern Spain aerospace facilities of HyperloopTT’s partner Airtificial, a new company formed by the merger of composite expert Carbures and engineering company Inypsa that manufactures for many leading companies including Airbus and Boeing. A total of 21,000 skilled engineering hours and 5,000 skilled assembly hours resulted in the birth of Quintero One. The new capsule boasts 82 carbon fibre panels; 72 sensors; 75,000 rivets and 7,200 sq m of fibre. The 32-m-long Quintero One boasts an inner cabinet length of 15 m and weighs 5,000 kg. The design for the capsule was created in collaboration with world-renowned transport design consultancy PriestmanGoode and won the Gold award at the 2017 London Design Awards. 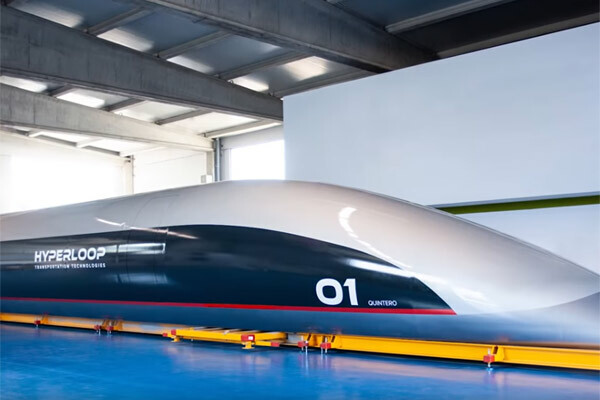 The capsule will be delivered to HyperloopTT’s research and development centre in Toulouse, France for additional assembly and integration into the system, before it is used on one of the first commercial tracks, said the company in a statement. "Working together with engineers from HyperloopTT, we are proud to be pushing the envelope of smart materials in transportation and manufacturing," said Rafael Contreras, the co-founder and chairman of Airtificial. "Today we have unveiled a new type of transportation vessel built with an industry high percentage of composite, which makes the Hyperloop capsule perhaps the safest transportation vehicle in the world," he noted. HyperloopTT co-founder and CEO Dirk Ahlborn said the creation of this capsule represents over a year-long journey of the best expertise in design, engineering, and the development of cutting edge materials. "In just five years, we have solved and improved upon all of the technology needed for Hyperloop with our new levitation system, vacuum pumps, batteries, and smart composites. This capsule will be a part of one of the most efficient transportation systems ever made," stated Ahlborn. Recently, HTT became the world’s first company to be able to offer an insured commercial system. In collaboration with Munich Re, the world’s largest reinsurance company along with global certification and inspection company TÜV SÜD, governments and partners, HTT is creating the first regulatory guidelines and creating the necessary legal framework for Hyperloop systems around the world.